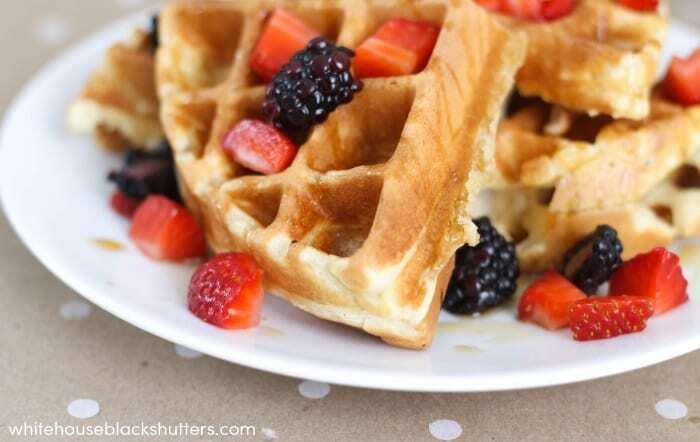 Looking for a recipe for waffles that are soft, buttery, yet slightly crispy? Here is the best waffle recipe EVER. Yes, ever! My husband, Doug, is a breakfast champ. He tweaked his recipe for pancakes adding a little bit more butter and this was the result. We’ve tried other recipes in the past, and even some mixes, but nothing compares to the texture of these waffles. You’ll need eight simple ingredients that you likely have on hand, 15 minutes or so, and a waffle iron. I have seen these pretty often at thrift stores or garage sales, so keep your eye out. 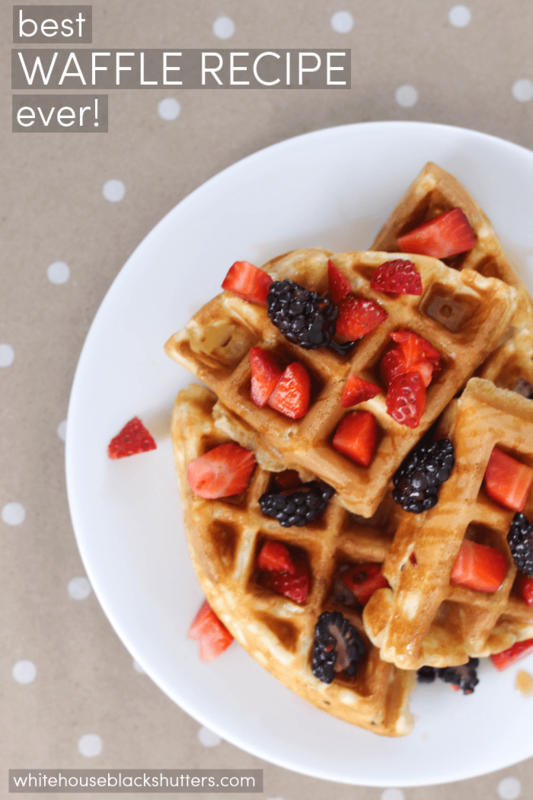 You’ll be making a wise investment – frozen waffles can’t compare to the awesomeness of these yummy waffles. This Tuesday, March 25th is International Waffle Day and would be a perfect time to try these out. In a separate bowl, beat eggs then add milk, butter, and vanilla. Add the wet ingredients into the large bowl of dry ingredients and beat until well blended. 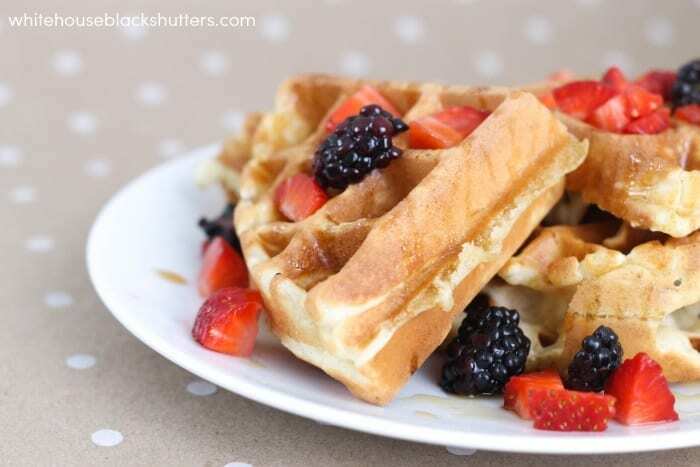 Pour portions into a pre-heated waffle iron, and cook until golden and slightly crispy. We like serving our waffles with combos of the following: butter, maple syrup, peanut butter, powdered sugar, strawberries, blackberries, blueberries, raspberries, applesauce, or even ice cream! Sometimes if I have fruit that needs to be used, I’ll just chop it up, add it to a saucepan with little bit of water and make our own fruit syrup. What do you put on your waffles? I made these today and my boyfriend said, “I think these are the best waffles,” and I said, “Well, that’s the name of the recipe….” Thanks, they are REALLY good!! I just made a lighter version of these and they came out perfectly! I used half whole wheat, half plain flour. I subbed unsweetened flax milk for the regular milk. I used unsweetened applesauce instead of butter. I have a 2-waffle baker (two 4 inch squares) and the recipe made 4 batches (8 waffles). Be careful not to put too much batter. They ride a lot! Love this recipe! Thanks. It depends on your waffle maker. For our 7 people, we double the recipe and triple it if we’d like leftovers for the freezer. I’d say a single recipe makes about 4 waffles for our specific waffle maker. Sorry – hope that helps! Can we make the batter the night before??? We have made it the night before, and it turned out well! Please tell me what you mean by a stick of butter. I am in Australia so need the amount of butter by weight. It should be a quarter cup of butter. A stick is a half cup of butter. These really are the best waffles! I’ve made them a few times and they always turn out crispy and buttery. I had a friend in college whose family always ate waffles with peanut butter and syrup. It’s super good! Thanks for sharing! We made a double batch and froze the extras. Now we can pull out a frozen waffle and pop it into the toaster any time! This recipe is a keeper. Thank you so much for posting it! Wow, that really looks wonderful! We always had homemade vanilla pudding and frozen peaches (thawed) or maple syrup. I thought that’s how everyone ate them till I grew up and ate waffles at a friend’s house, and she had never heard of it. It’s still my favorite way to eat waffles!